A new production process developed by a UK startup could reduce the cost of NFC tags to significantly under five cents a unit, making it practical for tags to be used in a wide array of new application areas. NFC tags could cost just a few cents in the near future, according to Allan Goodman of Additive Process Technologies (APT), who told NFC World the company has developed a new production method that could represent the tipping point for mass production and distribution. APT’s process involves a new way of packaging a traditional IC (integrated circuit) or PIC (printed integrated circuit) into an NFC tag product. Goodman maintains that despite over a decade of hype and promises for a sub-five cent tag, it still does not exist — except for APT’s newly developed ‘holistic’ process. Goodman states that the traditional, almost universal, process for antenna manufacture is etched aluminium or copper, or die-cut metal. UHF antennas can use thin depositions of silver inks, but these are becoming increasingly expensive. To date, so called ‘nano’ inks don’t make the grade either because they are too expensive to mass produce, he claims. On nano inks, Goodman adds: “More binder gives better adhesion but diminished conductivity. This is the case with all inks.” He continues: “Ink sintering processes are available too, but they’re generally substrate-constrained, expensive and not as conductive as bulk metal. In all but a very few cases, antenna and IC are seen as separate elements, which they are, but they also need to be connected. That’s where APT’s integrated process shines like no other,” he claims. “Conventional processes generally use expensive anisotropic conductive paste (ACP) or film (ACF) to connect IC to antennas on an inlay substrate, typically PET, which is an increasingly expensive petrochemical material. “However, APT’s process, building in one continuous operation, electroplates a copper antenna, in situ, directly onto the individual pads of the IC or PIC and on virtually any desired substrate,” he explains. Goodman continues: “A huge amount of NFC is about peer-to-peer, NFC-enabled device-to-device communication. But on the tag side, for ubiquitous item level RFID and NFC, which is key to the ‘Internet of Things’, an essential and enabling component of the value chain will be an ultra low cost robust tag and sensor attach manufacturing process. APT’s manufacturing process results in product functionality and process flexibility especially at HF (the NFC frequency), as a direct copper connection providing the lowest ohmic contact resistance between antenna and IC/PIC gives the absolute best possible performance and robustness, with less material, making it also low-cost, notes Goodman. Additionally, says Goodman, APT’s process is designed to change horses in mid-stream in response to customer demand, quickly shifting between UHF and HF, from size to size and between tag and antenna designs. Finally, he told NFC World that the current system is one metre wide reel-to-reel, and production systems will be built to produce well in excess of a billion RFID-NFC tags per year. 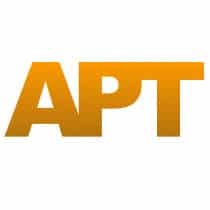 APT is currently looking for a strategic investor or venture capitalist funding to put the process into volume manufacturing.